The quaint landmarks of Vinegar Hill. When I first began writing and photographing Forgotten New York in 1998, one of my original shoots was in Vinegar Hill, an improbably isolated swatch of Brooklyn found by heading east on one of the DUMBO east-west streets all the way until there’s no further to go. The brick warehouses, powerhouses and light manufacturing that make up the eastern half of DUMBO (and indeed, until about 15 years ago, made up all of DUMBO, before it was rezoned and went residential) give way, rather magically, to a Brigadoonish enclave of frame homes, long-disused storefronts, and on parts of Gold and Front Streets, some attached brownstones that appear as if they were airlifted in from Park Slope. Vinegar Hill, which is roughly defined by Gold Street (west), John Street (north), the Farragut Houses (south of Sands Street) and the Brooklyn Navy Yard (east) had been settled in the early part of the 19th Century after John Jackson began developing his holdings there. 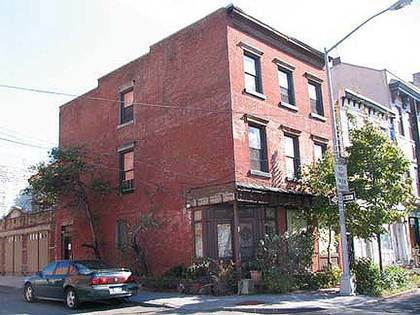 After selling part of his property to the US Government, which built the Navy Yard along Wallabout Bay, he subdivided the remaining land, building several houses, some of which survive along Hudson Avenue, Vinegar Hill’s “main” north-south drag (it was originally named Jackson Street: the name was changed sometime between 1825 and 1855. However, John Street remains). A proud Irishman, Jackson named his enclave Vinegar Hill after the June 1798 Battle of Vinegar Hill, an engagement in County Wexford, Ireland, during the Irish Rebellion of that year. (The rebels were defeated, and a massacre ensued—there would not be an Irish Free State until 1922). 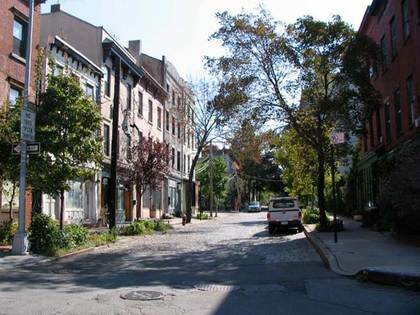 The street layout of Vinegar Hill has changed little over the decades, although too many buildings have been eliminated since 1916, including the historic, lofty steepled St. Ann’s Church (in 1992) at Gold and Front Streets and St. George’s Church (in 2009) at 109 Gold (both were torn down by the same developer). St. Ann’s was designed in 1860 by a local resident, Patrick Keely, one NYC’s most prolific ecclesiastical architects. Three immense Brooklyn Union Gas tanks used to stand at Gold and Water Streets (I wonder if the 1964 Republican Presidential candidate ever heard of this corner). South of Front Street, by the way, was once a lively (some say sleazy) row of entertainments along Sands Street serving the sailors and workers of the Brooklyn Navy Yard. Most of this was eliminated when the Farragut Houses were constructed in the late 1940s—a series of “towers in a park” built under the influence of French architect and designer Le Corbusier. In fairness, many of the houses torn down, documented by the photographs of Berenice Abbott in the 1930s, were poverty-stricken firetraps and at the time, it was thought that the towers would be a vast improvement. Le Corbusier’s philosophy has had some air let out of it as the decades pass, but Robert Moses was a disciple, and many towers in the park still dot urban landscapes worldwide. Vinegar Hill is best approached from the west along Plymouth Street, which in lengthy stretches is still boasting the same Belgian block pavement and railroad tracks belonging to the now-defunct Jay Street Connecting Railroad, which connected local warehouses and factories in DUMBO to East River carfloats. Plymouth Street is likely named for famed preacher Henry Ward Beecher‘s Plymouth Church of the Pilgrims on Hicks and Orange Streets in Brooklyn Heights. A chunk of Plymouth Rock is embedded in the wall of an adjoining church building, while a statue of Beecher at the church joins a larger one at Borough Hall Plaza. At Gold Street we begin to pass a huge Con Ed complex. Power can be heard sizzling and burbling through the dynamos, protected by a double helping of barbed wire. At length, after what seems like an eternity stumbling past power plants, broken pavements and forbidding warehouses, you encounter Hudson Avenue, the main north-south Vinegar Hill thoroughfare, which looks like a street in an upstate river town. In the 1800s, Hudson Avenue in Vinegar Hill was a main business strip, with butchers, tailors, tobacconists, bars and grills. In the 20th century the construction of Farragut Houses and the BQE cut the neighborhood off from the rest of Brooklyn and served to strangle it, so that population dropped greatly. Of late there has been an uptick as DUMBO became re-settled and some pioneers have been making their way east; 72 Hudson Avenue, built around 1870 by grocer John Shutte, houses the first restaurant to open in the neighborhood in decades, the Vinegar Hill House, opened by a couple who met working in Freeman’s (on Freeman’s Alley in Manhattan). A York Street bodega is still the main grocery, although more shops selling necessities have appeared in DUMBO as it becomes a mixed-use residential and office neighborhood. 49 Hudson Avenue, corner Plymouth, was likely constructed by John Jackson himself prior to 1835. 67 Hudson is one of the oldest buildings in the district—it was built by John Jackson in 1817, along with neighboring 69 and 71 Hudson. The year after the buildings were constructed they were sold to Captain Samuel Evans, who is remembered by a short east-west street. Little Street runs for one block, at least its public section, between Plymouth and Evans Streets. However, it is not named for its short length. According to Leonard Benardo and Jennifer Weiss in Brooklyn by Name, it honors a local tavern owner, John Little, who ran a ferry with Captain Evans from Little Street across the East River to Walnut Street in Manhattan. 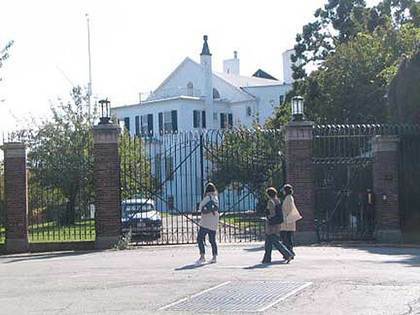 Unfortunately, the best view you can get of the palacial Naval Commandant’s House, constructed in 1806, is from outside these gates on Evans and Little Streets. When the Navy Yard closed in 1966, the Commandant’s House was sold to a private owner. Boorum & Pease manufactured and marketed office supplies, record-keeping supplies, and information storage and retrieval products, and was a leading manufacturer of blank books and loose-leaf binders. 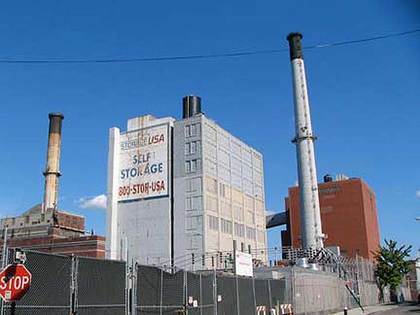 The company had an office and factory for many years in Vinegar Hill at Hudson Avenue and Front Street, and many Vinegar Hillers found employment here over the years. 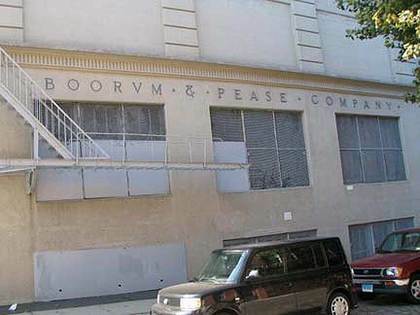 B&P, which had moved to Elizabeth, NJ, was acquired by Esselte Pendaflex in 1985. The sign is still there, with Boorum spelled with the V of Importance. 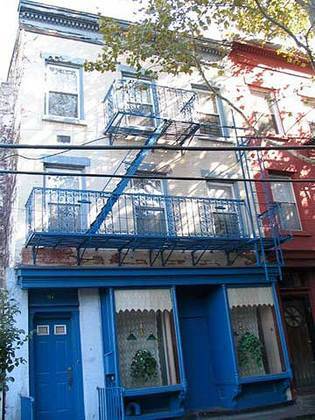 One of Vinegar Hill’s more evocative landmarked enclaves can be found on the north side of Front Street between Gold and Bridge Streets. Until 1992 this block was anchored by St. Ann’s Church at Gold and Front. 235-249 Front are brick 3-story homes built between 1840 and 1850. Additionally, the firehouse at 225 Front and former Benjamin Moore paint factory, 231-233 (designed by prominent architect William Tubby) have been landmarked. Every house has a different iron stoop railing, and most still have boot scrapers. 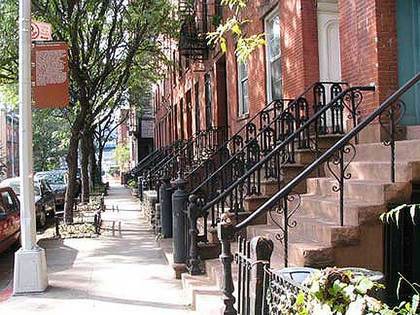 Seekers of Brooklyn throwbacks to more peaceful eras can do worse than an afternoon in Vinegar Hill.